I can still feel my mother hugging me so tight and repeating, “You’re going to get through this.” I can feel the tears rolling down my cheeks over and over again. Nonstop. I can feel the guilt associated with not wanting to be around my 9 month old son. And this was just the beginning of my whirlwind experience with postpartum mood disorders. Amber with her first son. In April 2014, my husband and I were holding our newborn son, in awe of his tiny little fingers and innocent whimpers. Everything during my pregnancy and delivery had been relatively straight forward, and we were thankful to be on the other side of labor. Fast forward through nine months of sleepless nights, boxes of diapers, and tons of selfies. All of the sudden, like a brick wall hit me, I was drowning in depression. Now, I had always heard about postpartum depression, especially from my mother ,who had experienced it herself. But nothing could have prepared me for the overwhelming sadness that I was going to experience. I couldn’t muster the strength to get dressed in the mornings, or make dinner for my family, or even reach out to anyone for help. I was lost. Waves of anger would strike me, and then periods of extreme guilt and feelings of being an inadequate mother would come along. My husband and my mother knew something wasn't right. 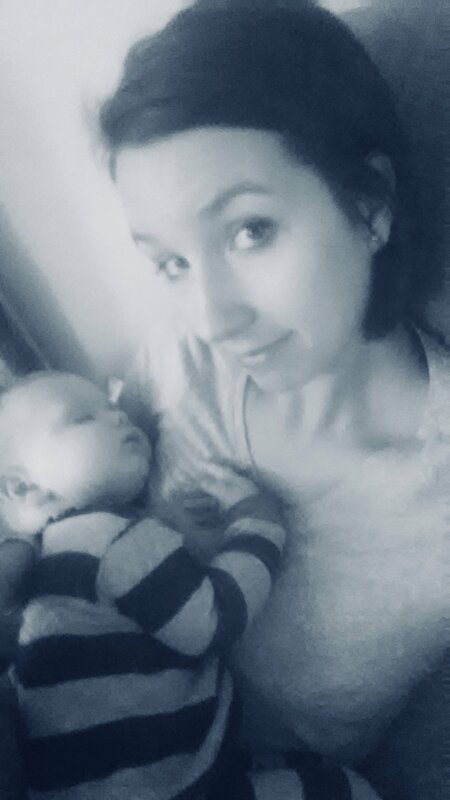 After a long talk with my obstetrician, resulting in a prescription for medication, and a phone call into Postpartum Support Charleston’s hotline, I was on the road to recovery. Roughly a month later, I was feeling so much better! OK. We are fast forwarding again about two years. In December 2016, we welcomed our second son into the world after an amazing and quick labor and delivery. This time around, I was prepared for the worst. I had my guard up from day one, ready to fight off any depression that would come my way. Amber, in the midst of her second struggle, pretending that all is well. Even though I wasn’t getting much sleep, I was rocking this motherhood thing like superwoman. I wasn’t working, and my older son wasn’t in preschool yet. I wanted to be the Pinterest mom of the year. But these waves of depression kept hitting me, and I would be extremely sad for a day or so. And then, all was well again! Up and down, up and down. Eight months of this. I thought I was “fighting” my depression away, until I wasn’t able to fight it any longer. I was in deep. I had serious anxiety about having to be a stay-at-home mom; I could hardly think about taking my boys on outings; and I was mad. The anger was so foreign to me, and the guilt that followed that anger and rage was overwhelming. So, I started seeing a therapist and working on my self-care. I also started taking medication again, as I did when I suffered from postpartum depression two years earlier. But this time, I had some serious side effects that made it necessary for me to switch medication. Then came the intrusive thoughts: those ideas that pop into mind that are horrific, scary and unwanted. Thoughts of hurting myself and my boys. I knew I needed some more help. And quick. Amber, with her youngest son, in a recent photo. After contacting a few wonderful women at Postpartum Support Charleston, I was given a grant to see a psychiatrist. And without this grant, I would have never been able to get the help that I needed to save my life. After my first visit with the psychiatrist, I was diagnosed with Bipolar II. I began the road to recovery that would last several months. I was intimidated by every moment, as I had no way of knowing how I was going to feel. It took several medication changes, lots of visits with my psychiatrist and therapist, and immense support from my friends and family to finally able to see the other side of this terrible mood disorder from which I suffered. This path to survival is something I will never forget. And as I volunteer with Postpartum Support Charleston, I hope to be that shining light for another mother who is enveloped by her own darkness. I truly believe that it takes a village to raise our children, and I am here for you.